Thaipusam Puja Procedure – How to observe Thaipusam? Thaipusam is a Hindu festival observed more in Muruga Temples and less at homes. After doing the usual pujas and prayers, people visit Temples dedicated to Murugan on Thaipusam to make offerings which mainly includes offering of milk and carrying of Kavadi. Here is a brief idea on how to observe Thaipusam. Offer yellow or orange color flowers. Carry Kavadi to the temple. Piercing of body parts as an offering with vel. Some people carry pots of milk on their head. This offering is believed to please Muruga. The highlight of the festival today is the piercing of different body parts with small vels (lances) as a sort of thanksgiving or as an offering to get their wishes fulfilled. 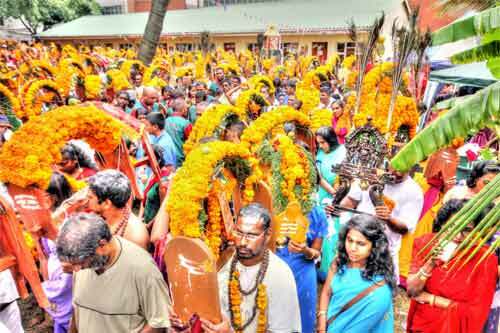 On the Thaipusam day, large number of devotees head towards Murugan temples in procession carrying Kavadi. The drumming and chanting of vel vel shakti vel electrifies the procession and some start to dance. Some devotees pierce their tongue and cheek with ‘vel’ (small lances.) Some insert hooks in their body and some use these hooks to pull heavy objects. On the day, devotees go to any length to display their devotion to Lord Muruga. Some devotees offer fruits and yellow or orange colored flowers to Lord Muruga. Some also take simple Kavadi to the temples. They wear yellow or orange colored dress. These two colors are identified with Muruga. Thaipusam is an important day for many temples in South India. Many Murugan temples in Kerala conclude the annual temple festival on the day.